Melissa said I could blog this recipe so here we go. I am her husband, the nerdy guy in the picture on the About page. Being half-turkish means I ate a lot of Mediterranean food growing up. We ate everything from baba ghonoush to za’atar. While I was tortured on the playground for eating food that wasn’t stuffed between two very white pieces of Wonder Bread, I did cultivate a bit of a taste for ethnic foods at a young age. I can still smell the kitchen when my mother would make stuffed peppers. There wasn’t a stuffed pepper I wouldn’t eat. Ground beef, tomato, and rice stuffed peppers were always a good choice, but being that beef and I don’t get along too much anymore, I obviously won’t be sharing that recipe. But, I can say unequivocally, my favorite pepper was rice, onion, and raisin stuff peppers. I adored these things most likely because they had raisins, and I love raisins. It’s a kid-in-me thing I guess. The recipe is below and this is my vegan take on the recipe. My mother use to add meat to this one as well, but I’ve removed it. I hope you enjoy. Put everything but the peppers in a pan and let cook covered for about 10-15 minutes on medium heat. When you remove the rice mixture, the onions should be soft, but not brown. As the rice mixture is cooking, pre-heat oven to 400. Also, get your peppers out, wash them off, cut the top off the pepper and remove all the white fleshy bits from the pepper. I also washed the inside of the pepper to get any straggling seeds left behind. 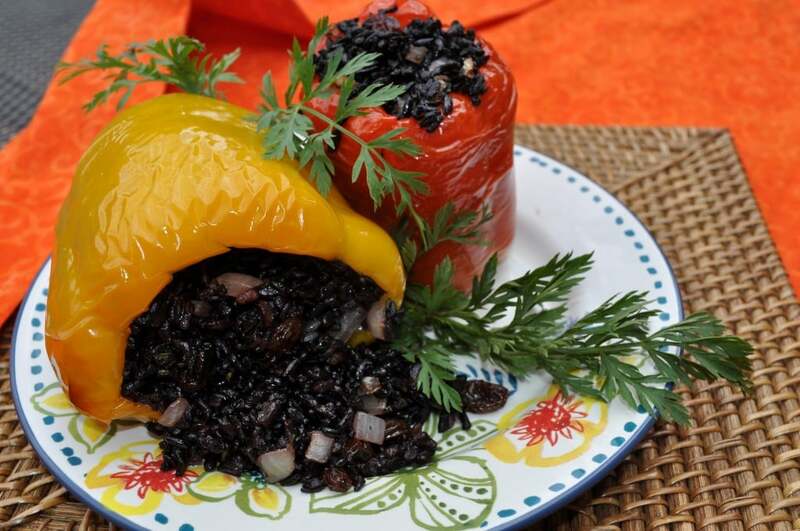 Once the rice is done, I brushed the peppers with a bit of olive oil to keep them moist in the oven, stuffed them with my rice mixture, and put them in the oven for 20 minutes. If you want a head start, you can cook the rice a night or two before you start this and refrigerate. We always try to keep some cooked rice around and we love black rice but really any non-processed rice would do. I added some oil to the rice to make sure it didn’t burn. Trying these tonight! I'm omitting the raisins though (it's a texture thing!). I was thinking of adding ground turkey to this. How do you think that would come out? Would you suggest adding any extra spices or tomatoes or something to the mix if I add the meat? I love your blog SO much. I have a bunch of your on the go breakfasts in the freezer right now. haha Thanks!!! Thanks! Yes, they can me made with ground meat. Traditionally, they are made with ground beef and tomato sauce, so that will be no problem. I hope you enjoy the recipe! I made the stuffed peppers tonight. I used a yellow pepper and a poblamo pepper. Both were great! Thanks for sharing your recipes! !